Your all idiots,if they’re gonna put kiss in the hall it should be all members not just the original four.By saying anything else your saying screw eric carr,vinnie vincent,mark st. john,bruce kulick,tommy and eric singer kiss has been an awesome band for forty years.also back in the day ace didn’t play most of his own misic in the studio anyway bob kulick did.another thing is all you people yaking about originals in bands sabbath changed singers and you still bought metallica new bass player and no dave and you still happally bought how many other bands changed lineups and no one said a word . 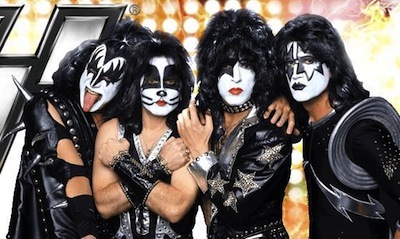 It’s so sad that Paul and Gene have turned KISS into a running joke. They do the same nonsense on stage and it has become so phony. I’d rather go see a good KISS cover band play live. That’s what KISS is: a bad cover band. I can’t believe I’m about to say this, but the Rock n Roll Hall of fame is 100% right regarding their position on Eric and Tommy essentially being clones. However, I do agree that at a minimum Eric Carr and Bruce Kulick should also be in. The band still had significant success in the non-makeup years and those two were a big part of it. The original lineup is by far my favorite, but I will listen to and support anything through the “Farewell” tour in 2000. Paul has apparently become a world class hypersensitive prima donna and I can’t listen to a word that comes out of his mouth. It’s too bad Def Leppard has to tour with this karaoke/tribute act; I always enjoy seeing them live in the summer in Saratoga Springs, but not with what was, ironically, my favorite band of all time. I’m so disappointed I missed Kiss’s “Farewell Tour” when they played at SPAC. I was living in California at the time and saw them out there, but I really would have loved to see them playing in the city I grew up in (Saratoga Springs) at the venue I worked for many years (SPAC). I think the argument has nothing to do with the Grateful Dead and everything to do with Metallica. Robert Trujillo was inducted and played on, what, one album. Not trying to bash Trujillo, but did he have any impact on what we know as Metallica? They clearly are in for what they did up to the Black Album. It is completely inconsistent. Paul is defending his life’s work. His career didn’t end in 1980. KISS was very relevant through the 80s. Every album from Lick It Up to Revenge is either gold or platinum and they have continued to headline large arenas around the world. Would the KISS makeup era be as relevant today had the band not been soldiering on for the the last few decades? KISS should be recognized for staying relevant. How many bands have defined an era and then thrived successfully through another? Singer, Carr, and Kulick, should be in for sure.